Botkier is currently having a 3-Day online sample sale in which you can shop Fall 2011 and classics at Up To 60% OFF Trigger, Bianca, Brinks, Misha...This sale runs from November 20th 9am EST to Friday December 2nd. At these deep discounts, this sample sale is fefiniely worth a look. To give you some idea on pricing available during this sample sale, the popular Botkier Brinks mini crossbody handbag made from the finest Italian lambskin and shown in the photograph here was originally priced at $225 but during this online sample sale is available at $113. 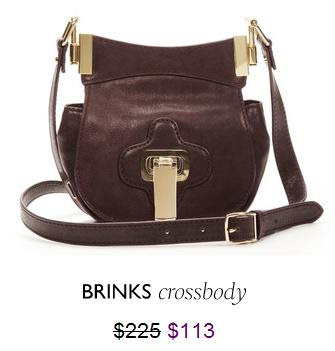 Similarly, the Brinks Satchel was $545 but on sale at $273. Another popular Botkier bag is of course the Misha. Originally priced at $635, this bag is on sale at $318. The Botkier Bianca medium satchel handbag was $595 but now on sale at $298. The Apollo crossbody was $345 and reduced down to a sale price of $173 and the Lake hobo down fro m$545 to a sale price of $373. As well as handbags, there is a range of shoes on sale including pumps, sandals, wedges and flats. The Dayna pump for example has been reduced down form $425 to $175 and the Mona sandal reduced down from $425 to $150. Very cute and unique bag.